Columbus Gas of Ohio Communications and Community Relations Manager Dave Rau lays out details of gas line replacements throughout Gallipolis. 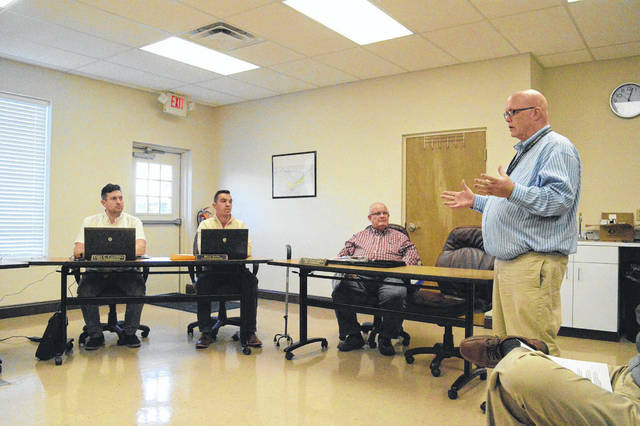 GALLIPOLIS — Columbia Gas of Ohio representatives approached Gallipolis City Commission Tuesday evening to discuss ongoing gas line replacements throughout town as part of a $3.7 million project to update lines that representatives say are as old as 50 or 60 years. Rau introduced project coordinators who took questions from the public and commissioners after explaining project details. Residents affected by the project have reportedly received an informational letter with contact information and project details to answer questions. Mainlines will be replaced first in the streets or by sidewalks. Then a few weeks might pass and another crew will come back and hook up homes to the new gas system. That work will involve shutting off gas service for two to four hours or “maybe a little longer” Rau said. If meters are inside the home, crews will move them outside the home for safety purposes as they reportedly have emergency release valves. This is to avoid getting any gas unwanted gas in a structure. Workers will take care of moving piping to new meter locations. When work is done, crews will need access to a home to be able to return service to the structure and inspect lines for safety. Around 62 meters will need moved out of homes. He said there were more serious problems discovered on occasion and a furnace may need to be marked and the furnace would need repaired by a customer before service could be returned to the appliance. The project will replace roughly 16,000 feet of pipe throughout town. Customers will reportedly not have to pay extra for the ongoing renovations, informational handouts said. Employees can be identified by marked vehicles and photo identification.Workers may temporarily block driveways or streets. If residents need access to a driveway, they are encouraged to let the crews know so as to safely accommodate a request. Handout information indicated that questions could be directed to Luke Papalko at 614-420-1376 or emailed to lpapalko@nisource.com.